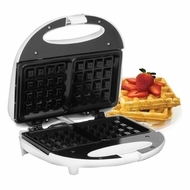 Enjoy extra large, crispy belgian waffles in just minutes with elite by Maxi-Matic's waffle maker. Quick and easy to clean. Upright storage design. Power indicator light and preheat light. Built-in thermostat. 750-watt.